First of all, I thank the editor of “Model construction” for the promotion of ingenuity, intelligence and talent of ordinary people, for the opportunity to use his rich creative experience, focused in the magazine. Keep up the good work! For my part, I would like to offer our readers a description of the very practical mini-truck. Practical in the sense that it is simple in structure, easy to operate and inexpensive to operate. 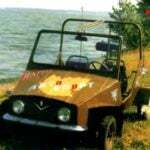 This is a simple vehicle designed for transportation of various cargoes and one passenger. I have long had plans of creating such a mini-truck — in the home he just needs. And when in my hands on occasion got a used motor scooter Muravey, its main components and parts has decided to base its four-wheeled cars, as against more stable tricycle. With minor revision, these components and parts (thanks to Tula engineering for the quality of their products!) allowed us to design inexpensive to manufacture and reliable in operation. The truck, named “Pathfinder”, it’s “Ant”, converted body forward. Externally it somewhat resembles a self-propelled chassis T-16. But in contrast, has the front drive wheels. Select the layout of self-propelled chassis due to the following reasons: rear drive wheels “Ant”, becoming from the front of the truck, increase its maneuverability, and front steer, becoming rear — maneuverability. This gives you a definite advantage when driving off-road or on the close economic court. To carry out the idea, I needed to modify regular front suspension; to produce a beam rear axle with bearing blocks at the ends; to adjust the steering wheel from the “Moskvich-412”, steering gear and ball joints from Suspension; to set the bodies of the throttle, clutch,brakes;make the seat and the dump body. Mini truck “Ranger” (on the front floor pan with spare tire not shown). 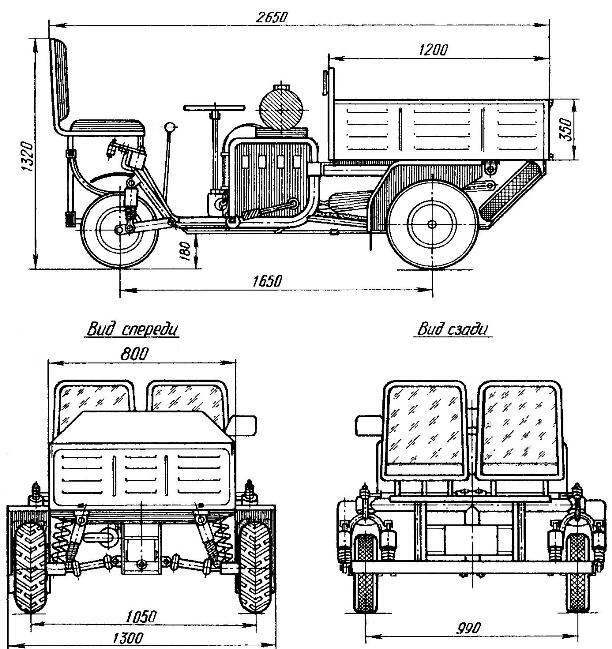 1 — passenger seat: 2 joint steering: 3 — frame seat; 4 — node rear wheels rotatable; 5 – the lever of a gear change; 6 mechanism of a steering; 7 — wheel; 8 — lever the reverse-reducer; 9 — fuel tank; 10 – engine; 11 — tipper; 12 folding Board; 13 – a protective tray; 14 — spare wheel; 15 — exhaust pipe; 16 — wheel leading; 17 — front wing; 18 — silencer; 19 – thrust braketion; 20 transmission chain; 21 – frame mini-truck; 22 — the lever, kick-starter; 23 — brake pedal; 24 — throttle; 25 — lever rod shifter; 26 — a fork of the steering wheel; 27 — steering wheel: 28 – shock absorber rear; 29 – bumper-bump; 30 is a wing back; 31 — the driver’s seat; 32 – spring suspension; 33 — front shock absorber; 34 — transmission main; 35 – axle shaft with u-joints. 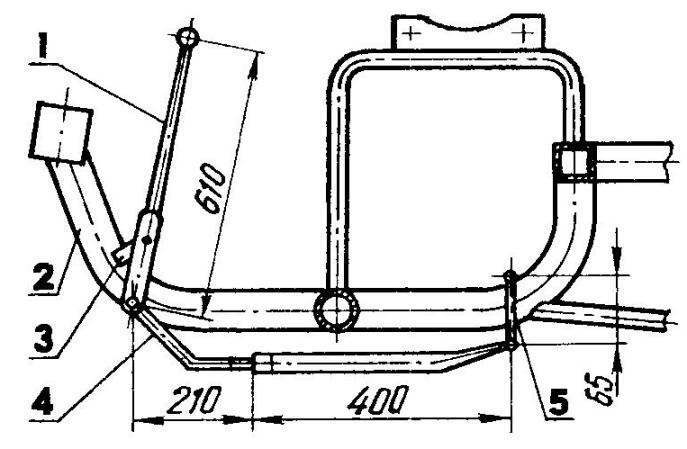 1 — the pivot sleeve; 2 — cross member (tube 30×2); 3 — mounting brackets floor (30×30 area); 4 — arc still the seat frame; 5 — lodgements fuel tank (steel, sheet s2); 6 — mount the front fenders (area 70×70); 7 — console mounting floor (pipe 25x25x2); 8 — Pro – turned, increased usina fixing the seat frame (2); 9 — rear axle beam (tube 48×5); 10 — gusset plate (steel, sheet 50×50, s2); 11 — knee frame scooter, the Central; 12 — mounting bracket of the clutch pedal (30×30 area); 13 — frame of the scooter; 14 — mounting bracket of the seat frame (4 PCs); 15 — stand (pipe 25x25x2). It took four months. The work went like clockwork, because mentally I already went to the “Pathfinder.” The finished and painted car was properly registered. However, as a… mini-tractor. This metamorphosis is explained simply: at the time I had a driving “rights” only on the tractor. However, this fact does not bother me to use the “Pathfinder” mainly as a vehicle. “Pathfinder” is a good helper at the farm. Except Gogo, drive it for mushrooms and berries and fishing. Operate the truck mostly only in the warm season, so the cabin did not. Travelling at 100 km and much fatigue do not feel. To operate the machine easily — all controls are located directly in front of the driver. And even though the pedals are spaced a little wider than the car, get used to it. Both the driver and passenger: the ride is soft, no wonder she’s got independent suspension all wheels. Everyone who ever rode Pathfinder, seated in the passenger seat, had, according to them, the inconvenience. Later, when the seats appeared armrests, and above them — a removable awning, the trip sounded even such a definition as “comfortable”. In short, a mini-truck as I pleased. It should be noted his passing ability, especially when it is loaded, because the leading wheels have a broad range of the motorcycle “Tula” (tail — of the scooter). That’s just the power of “native” engine is not always enough. Therefore, before towing a heavy load you have to change motorcycle wheel motorolleri, and paired. Body type mini dump truck, rotary. But it could be fixed. Then on the bottom it is easy to attach “the Zhiguli” chipper (engine under cover) with a spare tire — motorolleri wheel. In such a configuration the “Pathfinder” rather unusual, attracting the attention of passers-by. 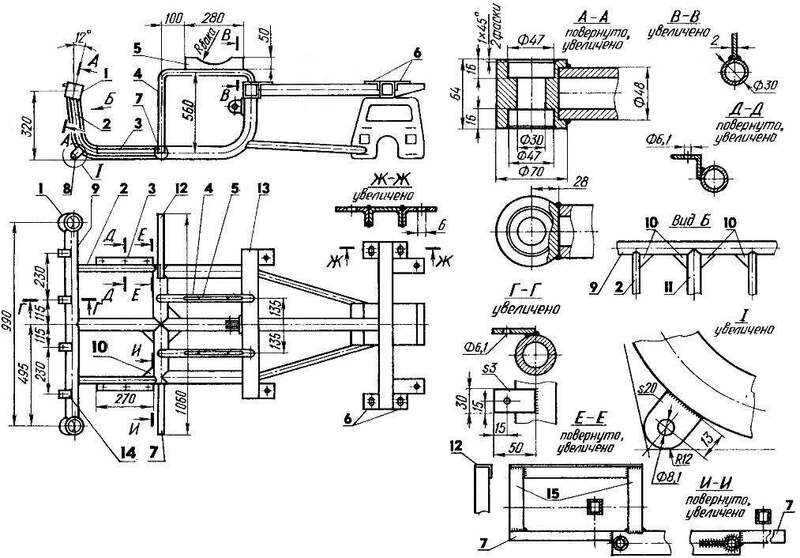 1 – seat frame (tube 22×2, 2); 2 leg of the seat (tube 22×2, 8 items); 3 reference beam (Pipe 25x25x2); 4 brace (pipe 22×2, 2); 5 —(pipe 25x25x2, 2); 6 – bumper-the bumper (tube 50x25x2); 7-stop (pipe 25x25x2,2 items); 8 mounting bracket to the frame of the mini-truck (4 PCs); 9 crossmember (pipe 22×2. 2pcs.). 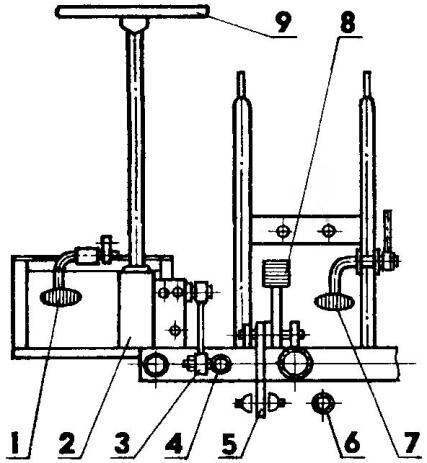 1 — ball pin (cars): 2 transverse thrust; 3 — a rubber joint (from the “Moskvich-2141”); 4 — rocking chair (the band s10); 5 — head rocking (tube 30×5); 6 — resistant sleeve (tube 26×3); 7 — tie mounts to the Central frame knee (lane s5); 8 — bearing housing (tube 77×15); 9 — bearing 204; 10 — driven shaft ( rough 20×4); 11 — time steering; 12 —longitudinal thrust; 13 – locking pins. 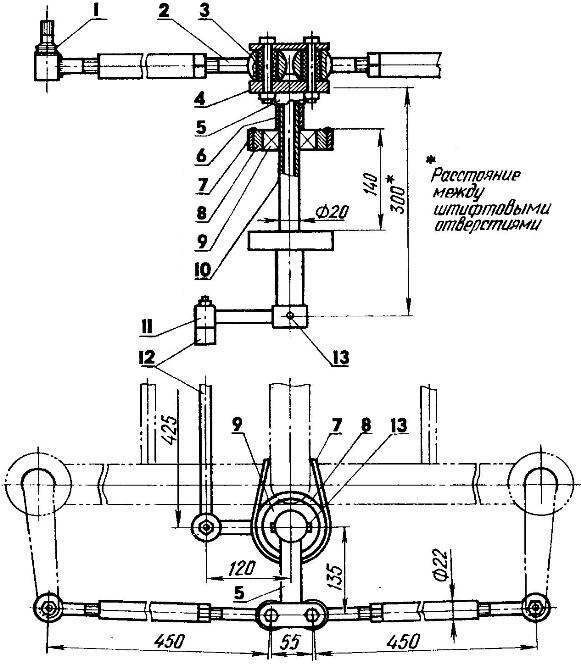 1 —the wheel (from the “Moskvich-412”): 2 – the steering mechanism (“Fields”); 3 — pull steering, the longitudinal (Lada); 4 — control arms, transverse adjustable; 5 — rocking chair; 6 — levers rotary; 7,9 — support bearing; 8 — shaft; 10 — time steering. 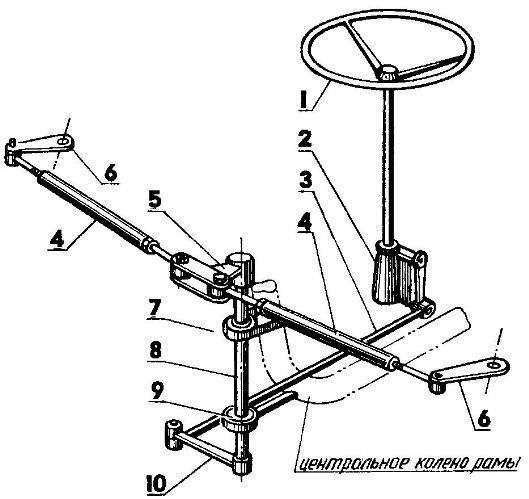 1 – a coupling pedal; 2 — the mechanism of a steering; 3 — plow power steering; 4 — pull steering, longitudinal; 5 – the lever of a brake; 6 — pull the shift lever; 7 – throttle; 8 – brake pedal; 9 – the steering wheel. When designing a mini-truck, I was guided by the need to ensure the following: sufficient strength and structural reliability, good stability and handling, efficient braking, optimal placement of all units, functional control layout, comfortable fit driver and passengers and, finally, aesthetic appearance. The FRAME is mini truck. 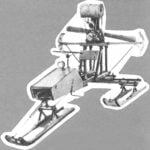 It served as the frame of the motor scooter Muravey, which added rear axle beam, beams, angles of attachment of the wings and cradles the fuel tank. REAR AXLE. It should be noted that the rear axle is one of the most loaded nodes design minigruzovikov. 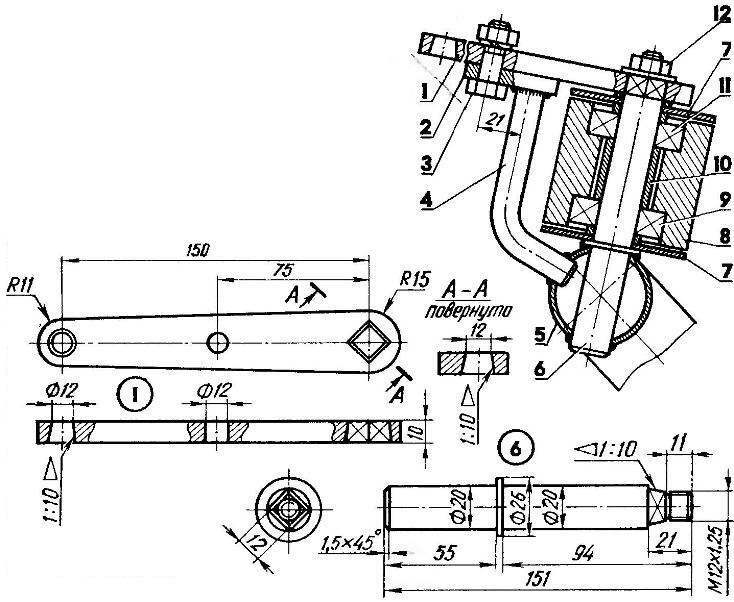 The successful opposition to the alternating torsional and bending loads rear axle beam needs to be rigid and strong and made of thick-walled pipe. She fixed on the former site of the steering column “Ant” (at the end of the main knee frame) and reinforced by two gussets. In addition, the right and left the beam to the back of the bar, repeating the bending of the Central frame knee “Ant” (the latter is important in order for the Polycom to the legs of the driver and passenger were smooth). The bottom yokes have the eyelets to attach the seat frame, and on the sides of the mounting bracket Polycom. Technological subtlety: I-beam rear axle I was attached to the frame Assembly with suspension — forks, shock absorbers and wheels. First picked up I-beam welded to the Central knee, and then, holding her to the frame and finally decided on the size, welded it to the elbow and Travers. 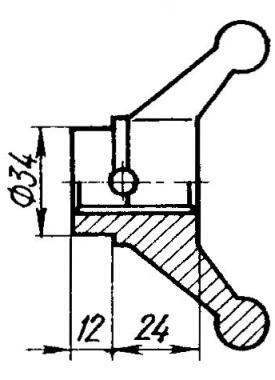 The angle of inclination of the pivot bushings 12° due to the use of wheels with size of 6.70—10″ — leading and of 4.00—10″ — slave. With this angle, the plane of the frame of the mini-truck parallel to the road. The angle can and should be changed in the case of using four wheels, the amount of 4.00—10“. 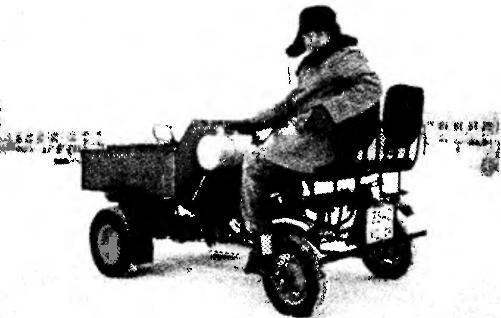 As the rear suspension used a modified front suspension two motor scooters “Ant”. Revision was reduced to the replacement of pin and fork connection to additional knee, reinforcing the connection of the plug with the rotating lever. 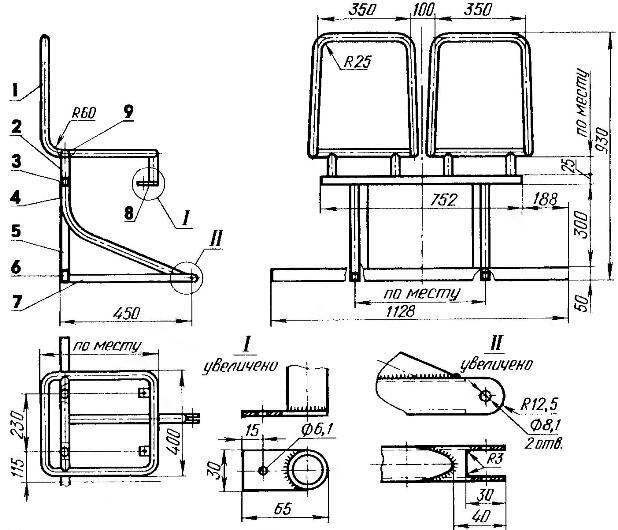 To the beam rear axle of its four upper brackets is attached to the seat frame with seats the driver and passenger. The two lower brackets (loops), this frame fits with eyelets traverse. FRONT AXLE, let me remind you, the presenter. To him include: reverse gear, suspension, springs, shocks, axles, brakes – all from the “Ant”. With a few modifications, these nodes are located in the same places under the body. ENGINE mini truck “native”, the T-200. Power it by installing a head with reduced combustion chamber is increased to 14 HP Instead of the regular ignition system is applied “magneto” to facilitate service of the power unit. The motor mount to the frame by the same. 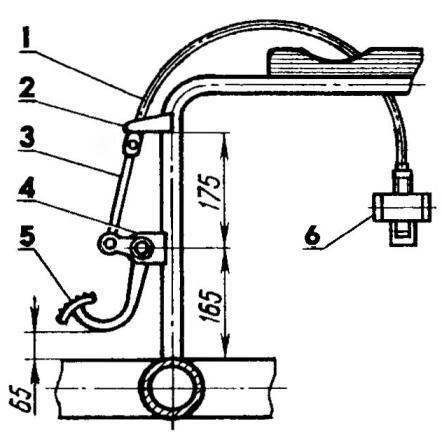 1 — the cable in the sheath; 2 — thrust; 3 — rod; 4 – a bracket of fastening of a pedal; 5 — throttle; 6 — carb engine (conventionally not shown). 1 – the bearing 104; 2 — gasket (rubber ring); 3 — case cover. Torque from the engine to the reverse gear is transmitted by a chain from the bike. For this sprocket, the leading (z — 14) and counter shaft (z = 27), customized to a landing the size of the chain by reducing the thickness of their teeth on a lathe. High tractive effort managed to get a replacement sprocket (z = 17) on “Minsk” with a smaller number of teeth (z = 14). Chain transmission at Pathfinder showed himself well; after driving 800 km to the possibility of its regulation is far from exhausted. And stars do not have obvious signs of wear. from the fuel high-pressure pump diesel engine, approaching the size of the landing slots. At Pathfinder installed a reverse gear from motor scooter cargo “the Ant”. The weakest of its parts — the axle shaft. At peak loads they break down, as weakened by the holes for fixing pins, and have significant backlash — universal joints, rubber couplings, as well as ordinary pendant does not contribute to the long life of the seats of the axles. To the undercarriage of the vehicle did not fail, I solved the problem dramatically. This has produced a new bearing cover of the differential, which is pressed in bearings 104 that are suitable for planting the size of the axles. 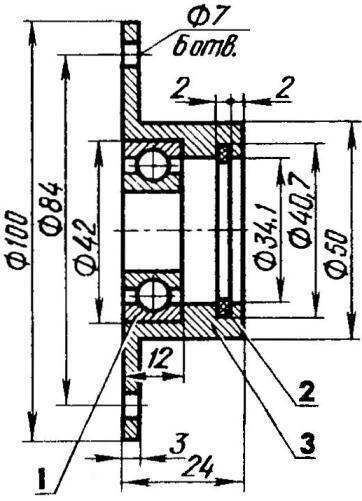 Modified plugs and universal joints: first, shortened; second, grind the outside so that there is the opportunity to drown the plugs deeper into the cover and thereby increase the reliability of their splined connections with the axle shafts. After that, the pins, the locking plugs on the slotted shafts become unnecessary. Still in my plans — installation of side gear wheels. This will improve the overall hanging design, will facilitate the work of the engine, increase the traction of the mini-truck. THE STEERING ACTUATOR. With its placement on the frame of the mini-truck in front of me there was a problem: how, without disturbing the driver and passenger, tie the steering wheel in front of the seat with the swing arm under the seat? After considering several options, I used a rocking chair that connects all the kinematics of the steering. Located the rocking chair at the top of the vertical shaft, which rotates in two roller bearings attached to the main knee frame clamps. Rods of variable length made of steel tubes and rods. On one end they have a ball fingers from the “Lada” on the other — rubber-metal joints from the “Moskvich-2141”. Traction allow you to adjust the amount of convergence of the steered wheels so that during the movement all the gaps in the steering actuator under the action of forces of rolling friction was chosen and the wheels become parallel. He steering gear taken from a car “Niva”. To it is welded a pipe column with the steering wheel from the “Moskvich-412” at the top. CONTROL SYSTEM. Speaking of her, I mean the mechanisms controlling the brakes, clutch, throttle carburetor, reverse gear. the right hand of the driver is the gear stick, under the left — reverse gear under the right foot — pedal throttle and brake, under the left grip (the last two pedals from the car “UAZ”, modified by the installation location). As clutch pedals and “gas” used brake pedal scooter “Tourist”. Mechanisms clutch control, throttle — cables; brakes, gearbox and reverse gear — pulling, hard. Traction brake and gear lever made adjustable in length. Lever air concentrator carb (“choke”) is located under the right hand of the driver on the seat tube of the frame. Reliable brakes guarantee the safety of any vehicle. Let not the engine is running, but the brakes should always be healthy — in the words lot of sense. Therefore, in the design of the mini-truck used a regular system of mechanical brakes “Ant”. The brake pedal is hard an adjustable rod connected with the rocking — equalizer brake force and further with the leading (front) wheels. The term “Pathfinder” will have a Parking brake acting on the steering (rear)wheels. The SEAT FRAME is a simple structure, welded from steel tubes of round, rectangular and square cross-sections, is bolted in six points, four of them located on the beam rear axle and two under the traverses. If necessary the frame can be easily dismantled, leaving free access to the steering actuator. Seat frames made of thin-walled tubes with a diameter of 22 mm, cushions and the seat backs taken ready-made from transport equipment. Vertical backrests provide the driver and passenger a comfortable fit. In addition, in order to eliminate lateral displacement of the riders with steep turns, later the seat was equipped with armrests. The FUEL TANK is made from the receiver of the braking system of a heavy truck “KrAZ”. To embed the selected arc of the former seat frame “Ant”: they are equipped lodgements, which with clamps and rubber gaskets dragged the pot. Capacity is about 35 litres, which is sufficient for a long drive. The fuel tank is fed by gravity to the carburetor of the engine. WHEELS. For steering used motorolleri tires with small, so-called highway tread pattern. They are less cling to the dirt, quickly self-cleaned, providing a satisfactory control on the road, and create less drag when driving on asphalt. EXHAUST SYSTEM. Its placement was not associated with any difficulties. Here is only one innovation — an extra knee at the outlet of the muffler, allowing the exhaust to withdraw gases from the body out to the right. This relieved the driver and passenger from the inevitability to breathe exhaust gases. BODY of mini-truck with a homemade 1200x800x350 size mm. Capacity. 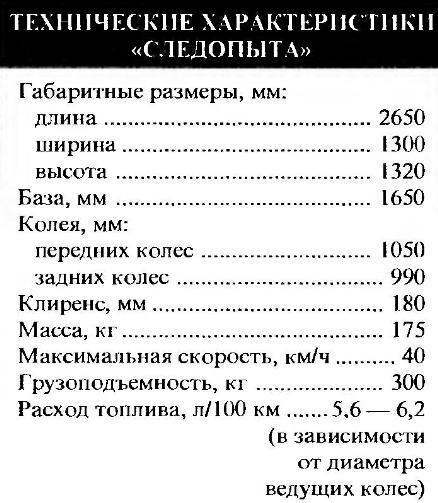 about 300 kg. The body is made of sheet metal duct (sheet thickness 1,5 mm). Side banded area, but you can pipe small diameter, pre-selecting the bottom of the groove throughout its length. Piping attached intermittent weld. The fact that the body — dump type, very convenient to operate. In addition, it allows lifting it, to do routine inspection and repair of transmission, not podleta under the car! SPECIAL EQUIPMENT. For safe on-road mini-truck equipped with a rearview mirror, and lighting devices from “Ant”. To this equipment include rear bumper-bumper and sump guard cars with spare wheel mounted under body. To protect the driver and passenger, as well as engine and other components from falling water and dirt, all four wheels are equipped with fenders and mud flaps. Wings wheels made from body parts of the inner chamber of a household refrigerator. For rear wheel used part of the front wings “Izhevsk” motorcycle. The three-year operation of the “Tracker” showed that he’s viable. Attracted by good design of the mini truck and many take it for industrial design. On the basis of “Pathfinder” you can make a four-wheeled motorcycle, a mini-tractor and ATV on the tires. Any of these machines will facilitate the work of the cottager, farmer or Builder.